It's not exactly a secret that I'm a bit fascinated by "LEGO artists"--especially those who enjoy recreating game characters and systems out of those colorful, interlocking bricks that most of us toyed with as kids. For instance, late last year I published this post about a LEGO GameBoy Color, and before that I published about a million posts about Filip Johannes Felberg's LEGO Pokemon creations. 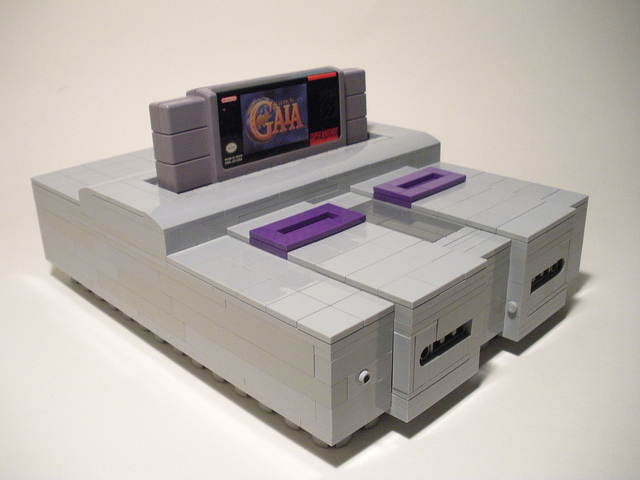 As awesome as all of the above are, I think the LEGO SNES below may be the most awesome of them all. Of course, I say that in part because it's a damn near perfect recreation of Nintendo's 16-bit system and in part because it houses a real-life copy of the Quintet-developed, Enix-published RPG, Illusion of Gaia. For more shots of this stunningly realistic piece of LEGO art--it even has a functioning eject button--check out this photo set by Flick user lego27bricks. I agree, Adam! I can't believe how much it looks like the real thing. This artist's LEGO GameBoy Color is similarly impressive, by the way. Whoa. I really didn't notice it wasn't real until I read the title. How strange and wonderful! And...Illusion of Gaia? One of my FAVORITES! At first glance it is *awfully* realistic, isn't Justin. Just amazing. As for Illusion of Gaia: God, I haven't played it in AGES! Yay Illusion of Gaia! I've had the itch to play play it's spiritual predecessor Soul Blazer a bit lately. That really is impressive. The level of detail is quite amazing. When I was a kid I had a ton of lego but could never really make anything that....looked like anything other than a big random pile of lego. My projects were usually about size, I could make the pile tall or wide, but I didn`t have enough to do both at the same time. a question: But "Illusion of Gaia" to do with Terranigma? Bryan Terranigma you know? You know that I was lucky enough to play and finish Terranigma for the Nes. It took me two years, because he was a kid. Fortunately, the game came in 1996. I'm sorry you could not play. But I was never able to play throughout the trilogy complete. Glad you liked it, Billy. And thank you for visiting my blog. Who's up for a Mario Kart 7 'gaymer night'?